We take protecting creativity online seriously, and we’re doing more to help battle copyright-infringing activity than ever before. Today, we are releasing an update to our"How Google Fights Piracy" report, which explains the robust programs, policies, and technologies we have put in place to combat piracy online. Providing new revenue streams for media industries and content owners:Content ID has also created a robust new revenue stream for the content industry. 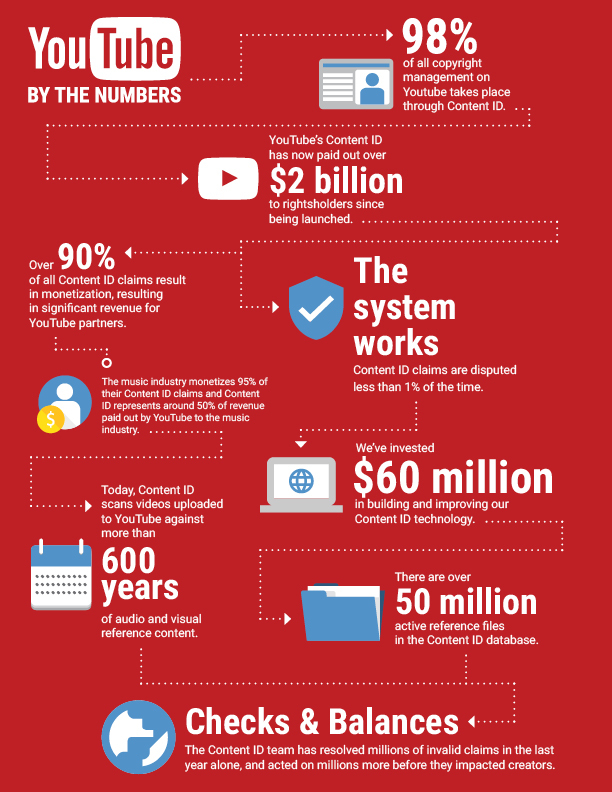 YouTube has paid out over $2 billion to rightsholders who have monetized their content through Content ID since it first launched. In fact, today well over 90% of all Content ID claims across the platform result in monetization. The music industry chooses to monetize more than 95% of their claims, opting to leave the content up on the platform - half of the music industry's YouTube revenue comes from fan content claimed via Content ID. Thanks to Content ID, YouTube is also the only platform that gives partners an automated way to directly monetize background/incidental use and covers.